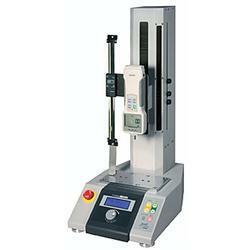 The EMX-275 Vertical Motorized Test Stand uses a precision stepper motor and ball screw drive that provide precise movement and smooth operation. Rigid construction assures minimum deflection to ensure consistent force and distance test results. 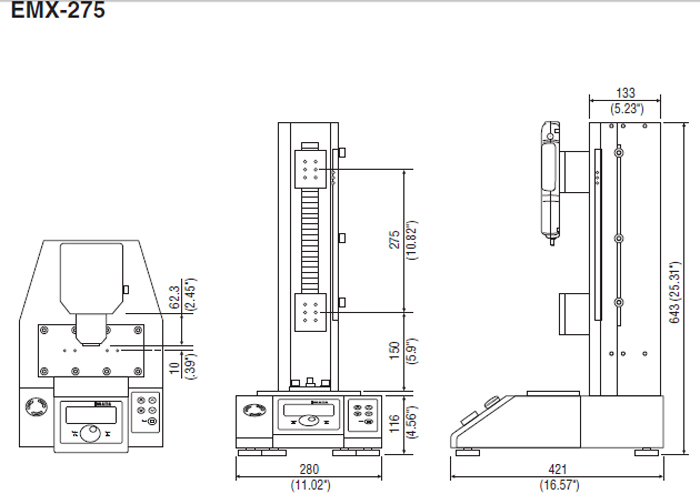 Precise Increment Testing - EMX-275 features a unique jog movement control, for precise increment testing. In jog mode, each click of the program dial moves the cross head exactly .01 mm (may reduce at maximum capacity depending upon material hardness). Force Control - Force controlled non-destructive tests are also easy to setup and program. Connect an Imada Z Series force gauge to the EMX-275 test stand to enable the following force controlled tests and Conditional Overload Prevention. Maintain Force Between High/Low Setpoints - Initial cross head speed is controlled by the start speed setting. Force control activates when applied force exceeds the low setpoint (and below the high setpoint) on the Z Series force gauge. The cross head maintains that force for the programmed interval and then uses return speed to reset for the next cycle. Increase Force to High Setpoint and Stop - Initial cross head speed is controlled by the start speed setting. When the applied force reaches the low set point of the Z Series force gauge, the test stand engages the measuring speed setting and stops when the applied force reaches the high set point on the Z series force gauge. Ideal for creep or non-destructive testing. The cycle is repeated until the counter limit is reached.